The Nicole Wertheim College of Nursing & Health Sciences (NWCNHS) offers a variety of donor-funded scholarships for deserving students across our programs each year. Enrolled students can apply during the Summer semester using the university’s scholarship website – FIU Academic Works. The site is updated constantly, so check the site often for new scholarships and application deadlines. Before applying for scholarships through FIU Academic Works, you must first complete the Free Application for Federal Student Aid (FASFA) form for the academic year. 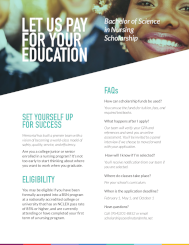 This information is extremely important in the scholarship awarding process and must be completed for you to be considered an eligible scholarship applicant. Once the application deadlines pass, the NWCNHS Scholarship Committee reviews applications to award scholarships to students based on academic merit, financial need, essay quality, as well as specific donor criteria (if noted). Scholarships are usually awarded during the Fall semester. Note: Scholarship awards from the Nicole Wertheim College of Nursing & Health Sciences may reduce other awards and loans, or the direct receipt of the money to students.